It’s that time of year again. School is out and the sun is out. Grab your bathing suit, your sunglasses and get ready to soak in the adventure! Summer vacation is always a blast no matter if you are going on a trip or staying home. 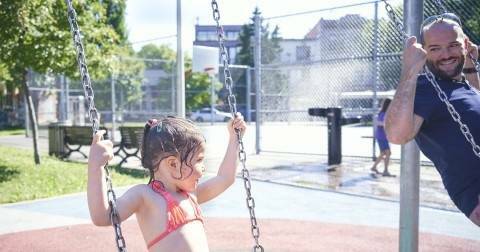 But with toddlers running around, summertime with kids can be tricky. Whether you’re going on vacation or creating adventures at home having a staycation, we have got tips to keep your little ones entertained the whole summer! Packing for a family can be a lot of work. Involve your little one in the packing process by making it into a game! Make it into a race and ask them to show you how fast they can bring their clothes to you to put in their suitcase. Just watch out they don’t sneak in ALL of their toys. To keep your kids excited for the journey, show them on a map where you are headed and what they can expect! You may need some mommy or daddy me-time when you get there, so pack some toys that are easy to travel with and involve a quick cleanup like the Take-Along Builder. 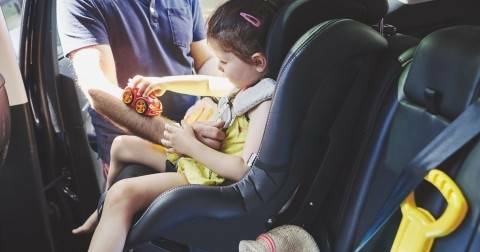 Taking a long airplane ride or drive with a little one involves a lot of “are we there yets?” Make sure to pack small toys like a little race car to let their imagination flow while mommy or daddy take a nap in the passenger seat. You can also play games like “eye spy” or pack a matching game to keep your toddler amused while teaching them about colors and shapes. Summer is always a great excuse to spend time with family. A backyard barbeque or living room movie night are easy and fun ideas to keep the whole family entertained. Whether it’s baking a cake, building a castle with blocks or spending a day at the park, you can involve every family member in the fun this summer! Do you have any exciting summer plans? We would love to see all your Mega Bloks summer moments! Make sure to tag us @megabloks on Facebook, Instagram and Twitter and use #BuildThemUp so we can keep up with your summer adventures!